The trend of bringing indoor comforts outside is still going strong. So, what are you going to do this year to make your outdoor space more homey? People are putting furniture, televisions and dining areas outside their house for relaxing or entertaining. Pergolas also are getting more popular because they make an outdoor gathering space feel like an open-air room added to your home. Pergolas have been around for centuries and at times have been a sign of wealth with features like brick and stone pillars. 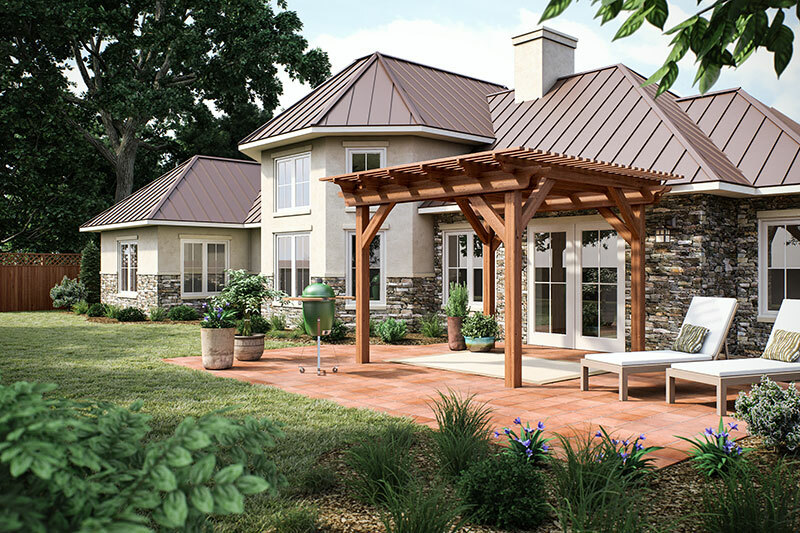 Today, most pergolas are built out of wood that’s affordable and durable, and they still make a bold statement by adding personality and beauty to your yard. Originally, people built pergolas into the landscaping as covered garden pathways. But even if you don’t have a big garden, there are still many ways you can add a pergola to your outdoor space. Build a pergola over your patio table and you’ve got an outdoor dining room. Build one over your lounge furniture and you’ve got an outdoor living room. Whatever activity you enjoy outdoors, a pergola helps define the space so that it looks and feels like a room. A pergola creates a feeling of privacy that’s just right for a hot tub or a fire pit. You can build a pergola outside your front door to make a striking entryway to your home. A pergola creates an outdoor room without walling off the outdoors. The slatted roof offers some shade yet allows air to flow through the space to make for a relaxing sitting area or reading room. Of course, a pergola can still be a great addition to the greenspace in your yard because it’s ideal for climbing plants and vines. Greenery over the top provides cover from sun and rain, while the underside of the roof and the walls offer space to create a beautiful hanging garden. Even though a pergola makes a big improvement to your outdoor space, building one doesn’t have to be a big job. It’s actually a job you can do yourself with a wooden pergola kit that includes pre-cut wood with pre-drilled holes and all the required hardware to put it together. You can save money doing the job yourself, and still reap the benefits of increased home value that a pergola provides. Plus, you’ll have a sense of indoor comfort outdoors!